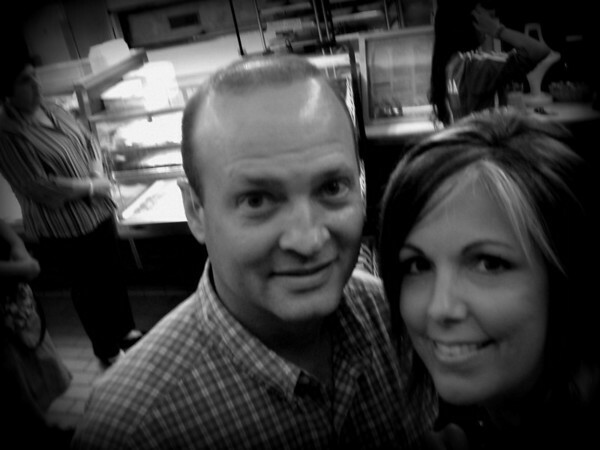 We celebrated our fifteenth anniversary Thursday. Fifteen years. 15. One-five. All day long I kept singing in my head that snippet from the song Gold Digger (the Glee version, not Kanye's) about the gold digger having his baby and having to support it for "eighteen years, eighteen years"...so if you know that song, then you know what I'm blabbering about--but I was singing fifteen years, fifteen years--and if you don't know the song, well, I apologize for leading you down a rabbit trail that led nowhere. As if I'd ever do that. Ever. So, um...yeah...about our anniversary. Since we are not big planners we rolled right on into Thursday with, you guessed it, no plans. A year or two ago I said out loud that I want to take a Mediterranean cruise for our fifteenth anniversary, and that's as far as we ever went with that, much less save any money toward that flash in the pan. I don't know, sometimes I'm on the fence about anniversaries. I do think marriage should be acknowledged and celebrated, since in our society it's often not honored, not valued and often cast aside, but I also think I can far too easily drink the anniversary Kool-Aid and think each and every one should (has to?) be recognized in some elaborate way--especially the milestone ones. Which of course can lead to disappointment and pouting. I blame my unrealistic romantic expectations on reading chic-lit (in a former life), watching too many romantic comedies and TV shows (um, soap operas anyone? I don't watch them anymore, but they left their mark). I say all of that to wind back around to my point that all the celebrating is nice, and perfectly A-OK, but it's the mundane day to day stuff, the daily life of a marriage, that really matters in the long run. So, it seems I may still be disappointed that our Mediterranean cruise never materialized after all. But back to Thursday. My dad and Peggy recently returned from their Alaskan cruise so Annelise packed her bag (she has this down to a science, people) and didn't even blink when we said we'd be going out without her. Scott and I went back and forth trying to decide where to eat dinner and what we might do afterward. We considered going to The Melting Pot, since we've never been (I know!) but neither one of us could get all fired up about dipping small chunks of food in various goo for three hours for lots of money. I know this is completely ridiculous, but the fact it is located in a strip center (you know, part of a shopping center) instead of a stand alone building, lessened its appeal in my eyes. I have no rational explanation for my reasoning, but there you have it. We decided to try a seafood restaurant not too far from us called the Monument Inn. The San Jacinto Monument, that is, marking the fateful place where Sam Houston's army defeated (slaughtered?) the villainous Santa Anna's troops and gained Texas' independence from Mexico in 1836. 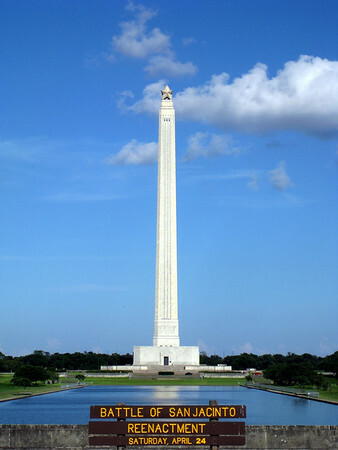 I don't know if this is completely true, but since no state is supposed to have a monument taller than the Washington Monument, we, the arrogant Texans, built ours as tall as the WM and then put a star on top, because everything is bigger and better in Texas. We're kind of sneaky too. I didn't take any pictures outside of the restaurant, but it was a stand alone structure (score!) and right on the Houston Ship Channel, so we watched cars get on the ferries and various boats sail along the water. Okay, okay, they were barges carrying large quantities of supplies and things. Not quite like watching graceful sailboats or yachts, but still interesting. Not romantic, mind you, but interesting. Scott had a fried seafood combination platter and I had the BEST stuffed flounder. Again, no pictures. After dinner we drove across Houston to catch a show at Radio Music Theatre. We had first thought about seeing a movie but the only one halfway interesting to either of us was Ironman 2, which, really, did not sound anniversary worthy. Radio Music Theatre puts on live comedy shows and is kind of an underground Houston tradition. We stopped for a self-portrait in front of the building and after ten attempts, this is the best one, even though I never quite got the building in it and managed to cut myself almost completely out of the picture. Scott was rushing me, what can I say? 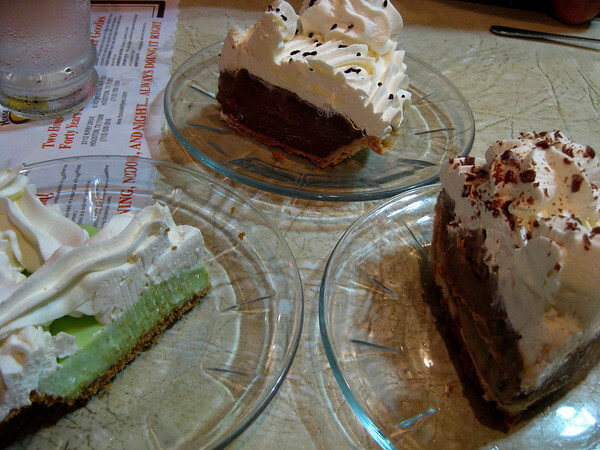 After the show we went a wee bit down the road to a delightful little place called The House of Pies. I'd never been there before--which is hard to believe given all the choices of pie--so I tried to document the experience with another self-portrait. Now, the House of Pies is open 24 hours and is a well known hang-out locale for lots of, how shall I say this...interesting Houstonians from all walks of life and in all forms of attire. Nobody even noticed that I took our picture, but Scott--who's usually a good self-portrait sport--was uncomfortable with me doing it. See? But enough about that, let's talk about the pie. Since I'd never been there before I had NO idea how big the slices would be, but I suggested we order a few so we could sample more of the pie goodness. When faced with fifty-ish choices I managed to narrow it down to two, Bayou Goo (a mysterious chocolate concoction) and Key Lime (something tart to cut the chocolate). Scott chose Chocolate Cream, which is like ordering vanilla ice cream at Marble Slab, because he said he just wasn't sure about something called Bayou Goo. 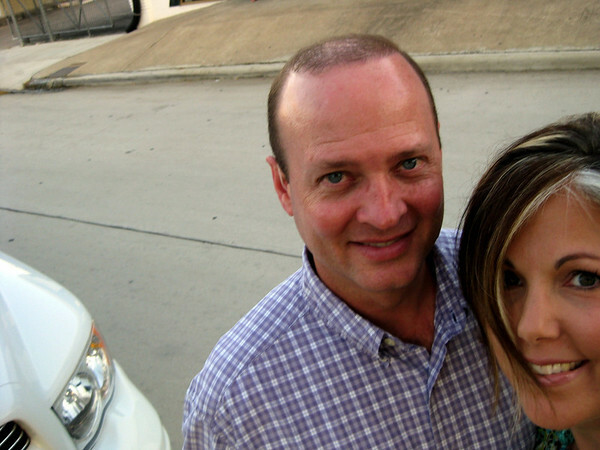 I tried really, really hard not to roll my eyes on our fifteenth anniversary. Guess which one he declared the yummiest after all? I share you view on anniversaries and your hilarious lack of saving for a 15th anniversary trip. I had wanted to go to Hawaii for our 15th, but life did NOT cooperate at all...maybe for our 20th. I would have ordered the chocolate cream pie too! happy anniversary holly! that song singing cracks me up. :) i'm on the fence with anniversaries, too... the biggest thing we seem to do lately is just hang out and go to sleep early. :) ha! 15 years!!!! that's awesome. honestly, it IS in accomplishment worthy of celebration. i love that a has grandparents so close and that she loves them so much. it just makes my heart happy. my little guy would LOVE to see his papa more often and asks me constantly- so i have a feeling many plane tickets and summer stays are in store for us. but it's not the same. and how much do i miss texas after reading your posts? i had this wave of humid hot air hit me (metaphorically) and i was there again. sigh. Milestone anniversaries are a big deal in theory to me but we always end up going out to dinner at a strip mall. lol, that cracked me up! For our 5th we took a road trip with Mike's band (oooh fun!...we got in a fight and I dropped the f-bomb for the first time at Mike...what sweet memory that is!) and for our 10th we had seafood and listened to a tech podcast on the way home. But for our 13th we did go to Disney World and Max was so excited to spend it with us at the Rainforest Cafe. So...all in all, I think it's about the everyday stuff, too. Growing more in love (and maturity) with every passing anniversary. That cruise will happen someday! Happy 15th! awwww...Happy Late Anniversary to you!!!! I'm so glad y'all got to go out for on a date! :) Yeah for pie! haha!